There has been a lot of news this month! Brittany Ryan, Robert St. Georges, Annie Smith St. Georges, Alanis Obomsawin, Sarah Garton Stanley, Rhoda Ungalaq, and Jeannette Corbiere Lavell. Not pictured: Lee Maracle, Maria Campbell, and Pauline Shirt. It was exciting to see the recent appointment of Christine Sokaymoh Frederick to the position of Associate Artist at The Citadel Theatre in Edmonton, and to see the rave reviews and huge response to Cliff Cardinal’s Huff at The Sydney Theatre Festival. It was equally exciting to see Mayor Naheed Nenshi’s response to Article 11’s Declaration which recently played in Calgary as part of High Performance Rodeo. So excited was the mayor, that he recently engaged in a twitter battle with playwright Tara Beagan’s brother on what city in Alberta Article 11 should call home. IPAA says goodbye to Cole Alvis its Executive Director as Cole turns his energies back to his art practice and ongoing work with Lemon Tree Productions. And finally, a huge congrats to Brittany Ryan who was named Producer of Nightswimming Theatre in Toronto. Earlier this month, interviews were held at the National Arts Centre with candidates put forward by the vetting committee. Coordinator for Indigenous Theatre, Brittany Ryan says: “I had the privilege and opportunity to welcome these incredible people outside the room, where they could take a breath before sitting in with the committee. It was exciting to speak with each of them because, despite all the formality of an interview, we realized that these are just conversations about what Indigenous Theatre could be. I think we all left feeling inspired.” The hiring process continues through this month and into March. The goal is to announce the Artistic Director in June 2017. Kari Cullen and Sarah Garton Stanley from the NAC, and Natali Zuniga from the City of Ottawa visited with Chief Jean-Guy Whiteduck, Grand Chief Verna Polson and former Chief Gilbert Whiteduck at Kitigan Zibi on February 6th. Sarah and Kari also met with Chief Kirby Whiteduck, Vickie Two-Axe and Christina Ruddy of Pikwakanagan, on February 13th. Both visits were made in preparation for the first meeting of an Algonquin Advisory Committee to be held at the NAC on Wednesday February 22. On February 14 (Valentine’s Day!) we gathered together for the first Elders Council. 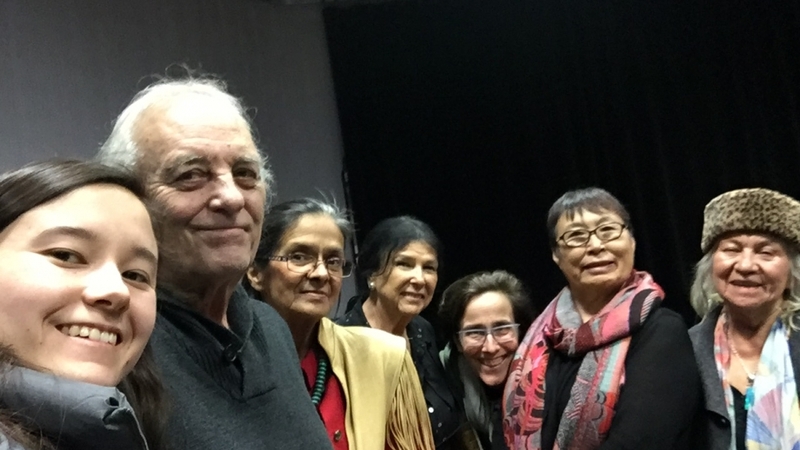 Rhoda Ungalaq, Annie Smith St-George, Jeannette Corbiere Lavell and Alanis Obomsawin were there in person, Lee Maracle joined us on the phone for over an hour and Maria Campbell and Pauline Shirt were unable to attend due to unforeseen circumstances. Robert St. Georges, Annie's husband, attended the meeting as Annie's helper. The goal for the first gathering was to meet everyone, to speak to the history that brought us to now and to discuss the role of the Elders Council as a part of the hiring process of the first Artistic Director of Indigenous Theatre. The next meeting is scheduled for March and will happen over the telephone. From February 17-20, Sarah was out at the Talking Stick Festival in Vancouver. Among the highlights was seeing the latest iteration of Margo Kane’s Moonlodge, directed by Corey Payette and interpreted by PJ Prudat, as well as a staged reading of Red Patch. The last day of the Industry series was dedicated to critical reception of the work. Lindsay Lachance put the day together. The NAC, under the leadership of CEO Peter Herrndorf, and all the employees, are continuing to prepare for the launch of the Indigenous Theatre Department. Education sessions for employees remain a priority, working with artists and producers from across Turtle Island on projects in every producing department is continuing, developing good relations with the Algonquin Nation and the people who are the past, present and future caretakers of the unceded land upon which the NAC stands, are all part of the day to day work at the NAC. More to do everyday.